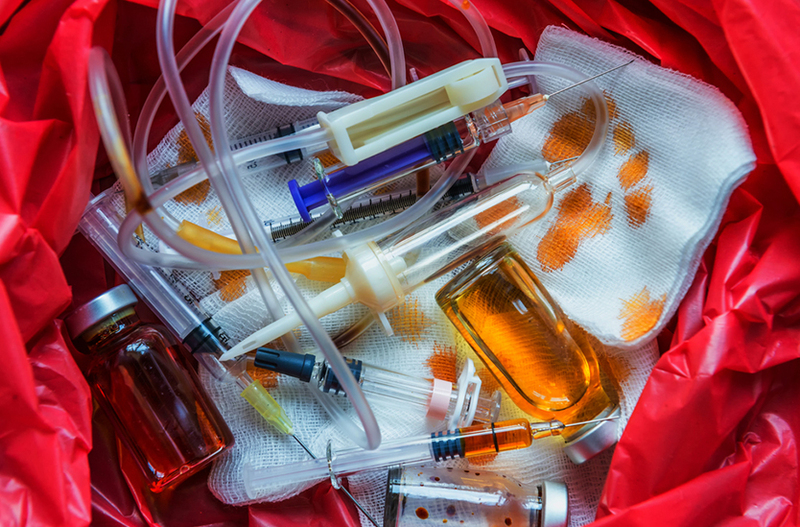 Waste Medic, LLC provides compliant transportation, treatment and disposal of regulated medical waste (RMW) in accordance with all laws and regulations at competitive and fair pricing. In order to provide services to a new client, we first conduct an initial medical waste review and breakdown analysis to help your company reduce waste and minimize your costs. Once your unique needs are determined, Waste Medic experts train your team on waste stream segregation, procedures and overall safety. Waste Medic develops programs for single space organizations or systems with multiples locations. We manage medical waste removal programs for all sizes of medical waste producers such as hospitals, clinics, ambulatory surgery centers, physician offices, urgent care clinics and pain centers. We also service labs, pharmacies, dental clinics, nursing homes, assisted living facilities, as well as dialysis centers, veterinary clinics, blood banks and funeral homes. Poor management of health care waste exposes physicians and staff, waste handlers, patients and the community at large to infection, toxic effects and injuries, as well as the risk of environmental pollution. It is imperative that all medical waste materials are segregated at the point of generation, appropriately treated and properly disposed of. Waste Medic consultation services are offered in all 50 states. Waste Medic provides reliable and cost-effective solutions nation-wide for a variety of medical waste needs… with no long-term contracts. Contact us today for quote. The experts at Waste Medic will analyze your current waste stream in order to guarantee it is segregated and disposed of in a compliant, efficient, and cost effective manner. With our training, Waste Medic ensures that our clients and their staff are all on the same page when it comes to the safety of their work environment including HIPAA and bloodborne pathogens.